From cave paintings to modern day street art, humans have been leaving their marks on walls for tens of thousands of years. But when does ‘vandalism’ become graffiti? And when does graffiti become art, or heritage? Dan Boys from Audio Trails attempts to leave his own mark on the subject. Graffiti, from the Italian word graffiare (to scratch), reflects someone’s urge to say something – to comment, to inform, entertain, persuade, offend or simply to confirm his or her own existence here on earth. The earliest examples of graffiti can be found in Burgundy, France, dating back more than 30,000 years. Within the caves of Grottes d’Arcy, simple, yet fluid drawings of mammoth can be found on cave walls. In the Roman world graffiti was used to declare an allegiance and illustrate the vicious rivalry between Roman communities. And today, political messages can be found on almost every street corner. These walls often become sites of conflict too. The spray paint can as we know it was patented in 1949. Within 10-15 years it was being put to use on the blank canvases of urban walls in America before quickly spreading across the world. 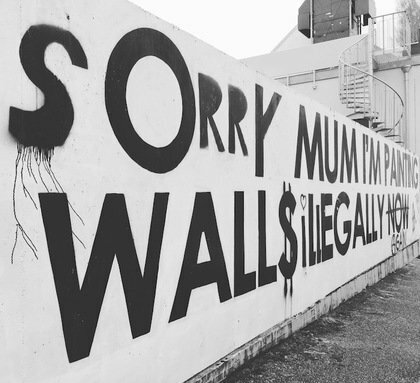 Colourful murals, ‘throw-ups’ and ‘tags’ created a moral panic. To those in power it was a symbol of decay. To others it energised the world of art. It is probably these kind of images that are conjured up in your mind when you think of the word ‘graffiti’. Today some artists are paid to paint large murals on or in buildings, and they have also been used to good effect as an interpretative tool too. At Magna Science and Adventure Centre, Audio Trails commissioned The Mural Artists to paint a room-wide mural to create a layer of interpretation when the panels and AV installations are removed for events. Clearly the context is fundamental, but what is the criteria? 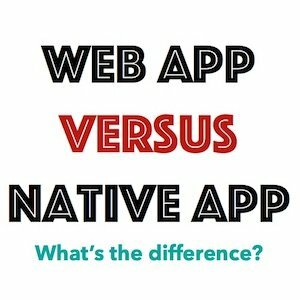 For example is graffiti with a date, or a statement, more important? Does graffiti linked to major world or political events carry more credence? And who gets to decide what is and what isn’t heritage? Certainly art associated with prisoner-of-war camps and other places of incarceration e.g. 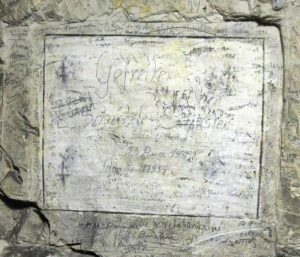 graffiti and emblems carved by prisoners in the Tower of London, the French Napoleonic graffiti at Portchester Castle, Hampshire, and graffiti on the cell walls at Yorkshire’s Richmond Castle drawn by conscientious objectors in 1916 is viewed as signifiant heritage today. And attitudes have clearly changed. the context of its military use or occupation” – reflecting the elevated attention paid to graffiti in military contexts. He was killed a month later at during the Battle of Pozieres. Scratched into the red brick wall of an old outbuilding in Newport Street in Brewood, Staffordshire are the names of several Great War soldiers. 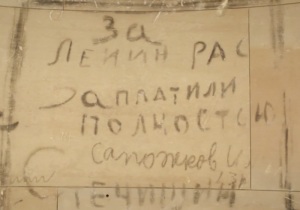 The earliest dated inscription is that of “J.M.,” carved in 1915. A Staffordshire Knot appears below the letters “H.D.”, inscribed in 1917, and this suggest the latter joined their local regiment, the South Staffordshires. Many of these names correspond with the war memorial erected in the churchyard of St. Mary the Virgin and St. Chad, just a few streets away. But some did return. Among them were G. W, who first made his mark in 1917 and returned in 1922. At Shugborough Hall in Staffordshire stands the Grade I Listed Triumphal Arch. 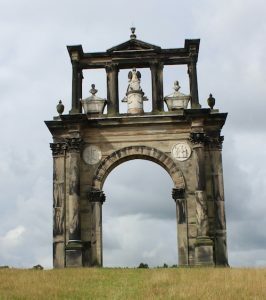 It was completed in 1765 and is a copy of the ancient Hadrian’s Arch in Athens. It commemorates Admiral Anson and his wife Elizabeth, whose brother inherited the estate in the 18th century. 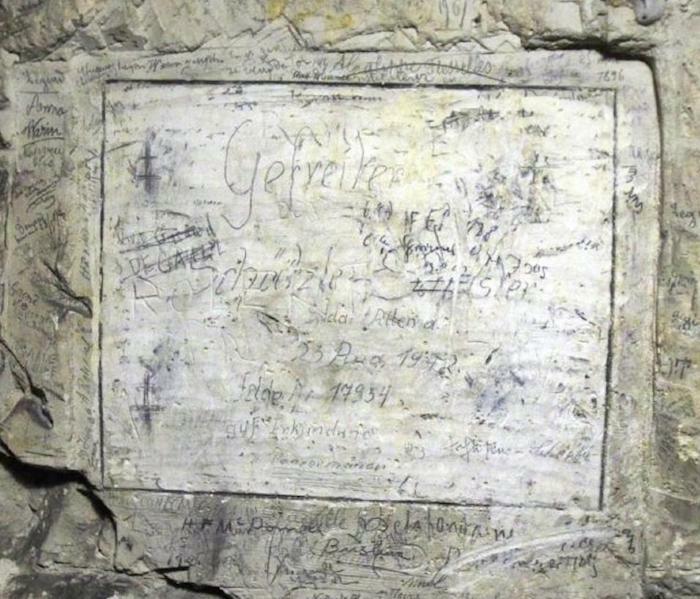 Over the years names and drawings have been scratched into the stone monument, within a zone 30-180cm above the ground. Nine names have the initials NZ or NZRB adjacent to their names and dates cover the period 1915-19. These may indicate they have a connection to New Zealand, or the New Zealand Rifle Brigade (NZRB) who made Cannock Chase their home and UK Headquarters between 1917-19. I am are currently co-ordinating a HLF-funded project that celebrates the NZRB’s time on Cannock Chase a century ago, and these names give us a starting point to research who these men were. As the act of graffiti is generally associated with a youthful demographic we felt it would be pertinent to work with a couple of youth groups to record and research the graffiti and use it as a hook to engage them into the story of the troops who travelled halfway around the world to train on Cannock Chase, before they entered the theatre of war on the Western Front. The local Young Archaeology Group and the Cannock Army Cadets met us for two separate events at Shugborough’s Triumphal Arch. 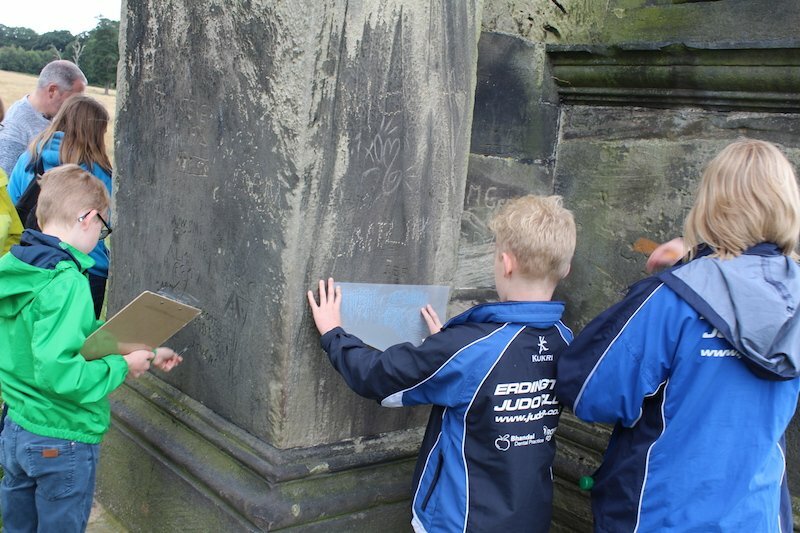 We began the session by introducing the estate and then focussing in on the monument itself. We asked the attendees to study the graffiti and say what caught their eye and why. Everyone was asked what they thought about this graffiti and we discussed why people make marks like this and whether it was criminal damage. We looked at it from the perspective of the ‘artists’ and the landowner. We then introduced the story of the NZRB and asked the group to identify any associated military graffiti on the arch. Our next step was to record the etchings. 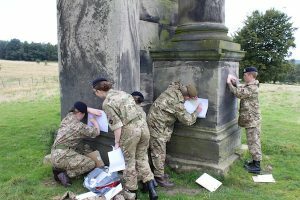 Photographs (square-on and with a tape measure to provide details of the size), drawings and rubbings were taken and some of the group drew plans of the arch and indicated on which faces the graffiti was located. Before we left we talked about whether the graffiti should be preserved, and how. And finally we discussed the rest of the graffiti and its importance. We then asked the group to follow up with some desktop research by providing them with a resource pack containing information about one of the soldiers, plus online links to search for further information. What did we find? Two of the names: E.Purcell and B.Bayliss appear to be from 1915. This year not only pre-dates the NZRBs arrival at Brocton Camp on the Chase, but also the Brigade’s formation. Therefore, we have surmised that this engraving may belong to Ernest Purcell who was killed in Dardelles in August 1915. Did someone else inscribe his name as a memorial? There are no soldiers with the surname Bayliss with a first name beginning with B. Could the B stand for Bill or Billy and therefore be listed as William in official records? There is a Charles and James Bayliss both with the middle name William. Both were alive in 1919 but we have found no no direct connection with them at Brocton at this time. At the other end of the timescale we have H.Beavis’s graffiti dating to 12.1.19. There were several H.Beavis listed on army records but only Harold Beavis was at Brocton Camp on this date. He sailed here on the Tofua, arriving in October 1918. A high percentage of the passengers died from the flu epidemic that took so many lives during World War One – many of the 73 New Zealanders buried in the Commonwealth War Grave on Cannock Chase are believed to have died from ‘Spanish Flu’ – so Beavis may have considered himself very lucky. And perhaps luckier still because he never saw action. What we have learnt from Beavis’s records is that he was a cabinet maker. Was he employed at Shugborough to fill the vacuum of British workers who had served on the Front Line? ‘C.Thomas 31/5/18’ probably refers to Cecil George Thomas. Like many NZRB soldiers his parents were British citizens who were incentivised to travel to New Zealand in the years before the war. From his records we discover Cecil was born in 1894. He had a fair complexion, light brown hair, blue eyes and stood just 5 feet 2 inches tall. He was married with one young daughter. Before enlisting, Thomas was a tannery labourer. He initially served with the New Zealand Expeditionary Force and was hospitalised with influenza in 1917, probably on his way to Brocton Camp. He was wounded in action the following January whilst in France and returned back to Brocton in spring 1918. It was shortly afterwards that he found himself beside the Triumphal Arch with some time to spare. At the time of his discharge in 1919 his trade was given as a farm labourer. Like Beavis this gave him a potentially legitimate reason to be on the estate. Thomas died in 1962. The date for A.E.Stephens is in decipherable. He was an accountant before the war and like Thomas was married with one daughter. He joined the 5th Reserve Battalion of the NZRB in May 1917 and after several months of training at Brocton Camp left for France the following October. In March 1918 he was recorded as “sick” in hospital and three months later “classified ‘C’ class by NZ Standing Med[ical] Board”. According to this blog (http://1914-1918.invisionzone.com/forums/index.php?/topic/154834-fitness-classifications/ ), soldiers classified C were “Free from serious organic diseases, able to stand service in garrisons at home”. By the time Stephens arrived in Torquay the following month he was classified “unfit” and “embarked for NZ” from Plymouth in August 1918. His disability was cited as neurasthenia – “an ill-defined medical condition characterised by lassitude, fatigue, headache, and irritability”. It was believed to be more common among the educated than the unskilled, and the cause was thought to be environmental – it was brought on by what are today regarded as stress factors such as emotional upset, bad experiences and over work. The cure was said to be rest. 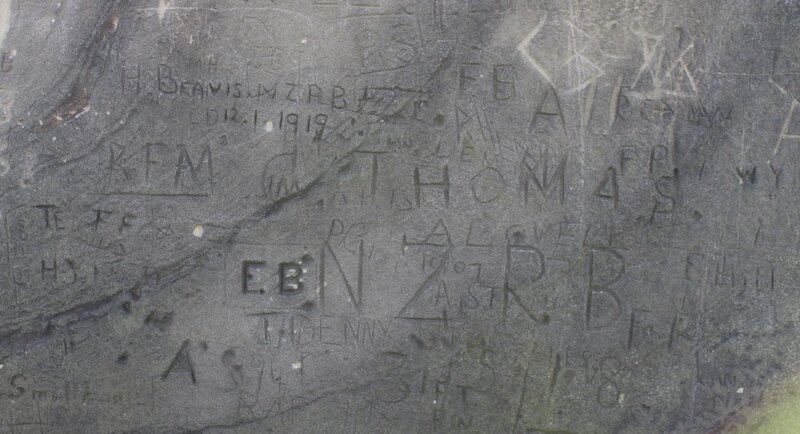 The year of Job Wain Frew’s graffiti is unclear, but by looking at his records we can see he arrived at Brocton on the 15th May 1918 and was in France by August of the same year. A single man of Scottish parents, he arrived in the UK on the Tofua (six months earlier than Beavis). Unlike the previous men his Conduct Sheet was not clean and Frew has several entries. He was put on detention and forfeited 12 days pay on one occasion, possibly for breaking out of camp and/or overstaying leave during active service. He was certainly absent without leave at Brocton Camp from midnight 19/7/18 until 7pm the following day and forfeited 1 days leave. By 1919 he was declared unfit after contracting Tuberculosis on active service. It appears this was responsible for this death in 1928. Discovering the stories of these men has been an exciting journey, which has led to further stories, such as Thomas Heeney. He became a professional boxer after the war and is still the only New Zealander to have had a world title fight. Dan’s interview for the position of Project Coordinator was very impressive and it was obvious he was going to be more than capable of handling the post. His communication skills are very good both with the public and liaising with the committee overseeing the project. Dan’s excellent organisation of meetings, events, correspondence and deadlines ensured a smooth flow throughout the timescale of the project. His ideas of how to be flexible and innovative with the outline of the project gave a different and more productive outcome to those that were expected. Dan has an obvious wealth of experience with this line of work and has contacts that can carry out any task given to a very high standard. I would therefore highly recommend him to anyone else wishing to recruit a heritage interpretation consultant. He has a good rapport with any generation and observing his handling of events was a pleasure and thoroughly enjoyed by all. Samuel Merrill, ‘Keeping it real? Subcultural graffiti, street art, heritage and authenticity’, International Journal of Heritage Studies (Vol. 21, No. 4, 2015), p. 373.